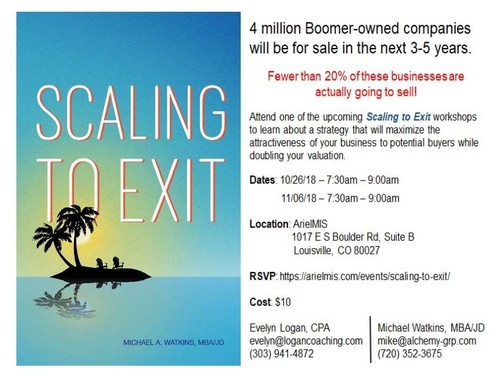 There are 4 million Baby Boomer-owned companies going up for sale in the next 3 to 5 years. Statistically, less than 20% of these businesses are actually going to sell! Are you one of these businesses? If so, realize that it is going to take a minimum of 3 years to accumulate the track record necessary to make your business attractive to a potential buyer. And, if you wait 3 years from now, it will still take 3 years! It is often said that most people are capable of dealing with adversity, but few can cope effectively with success. The psychology behind this fact is beyond the scope of this book, but the truthfulness of the statement deserves attention. So, are you prepared to cope with success? If the answer is yes, then you need to attend this workshop to learn about the Scaling to Exit approach and methodology. Millions of Baby Boomer business owners are on a path that will leave them with an insufficient nest egg for their retirement. The Scaling to Exit program will enable the rescue of many owners from such an unbearable fate.